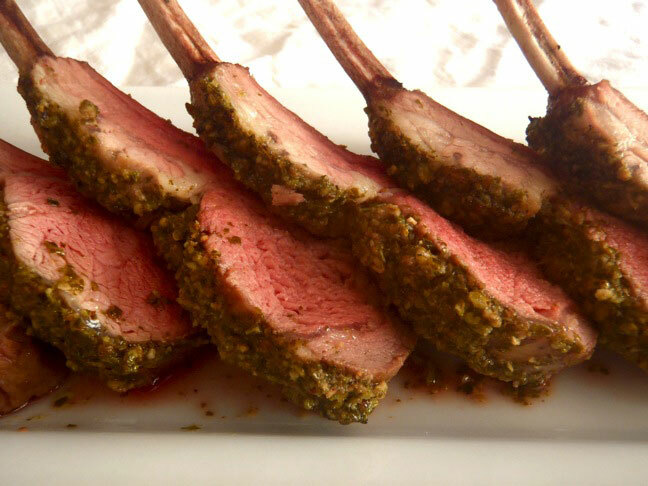 Fresh herbs and lamb are the most amazing combination This beautifully presented Pesto Crusted Rack of Lamb will be a perfect part of an alfresco brunch, lunch or dinner.. This dish is much easier than it might look. To make it even easier, you can substitute a good quality store-bough pesto (like Barilla Rocket and Basil Pesto), instead of making your own. Once you’ve glazed your first lamb, you’ll be coming up with all sorts of “crust” ideas for future meals. Heat the oven to 180ºC. In a food processor, make the pesto by blending the basil with the garlic, Parmesan and pine nuts. Wait until each one is blended before adding the next. Then gradually blend in the olive oil. Season to taste with salt and pepper. Set aside. 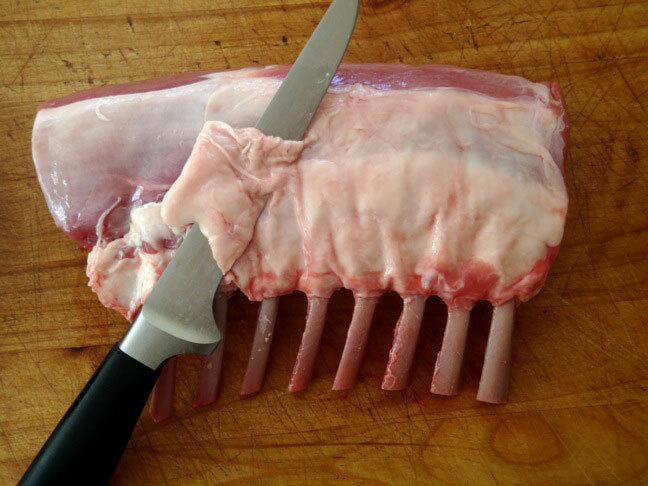 Carefully trim off any excess fat off the top of the racks of lamb, trying not to cut into the meat. Coat a large saute pan with olive oil and place it over high heat. Season the lamb generously with salt and pepper and sear in the pan once it’s hot. You should hear a sizzling sound when the meat hits the pan — if you don’t hear a sizzle, wait for it until the pan is hot enough.! Brown both sides of each rack, about 1 minute per side. 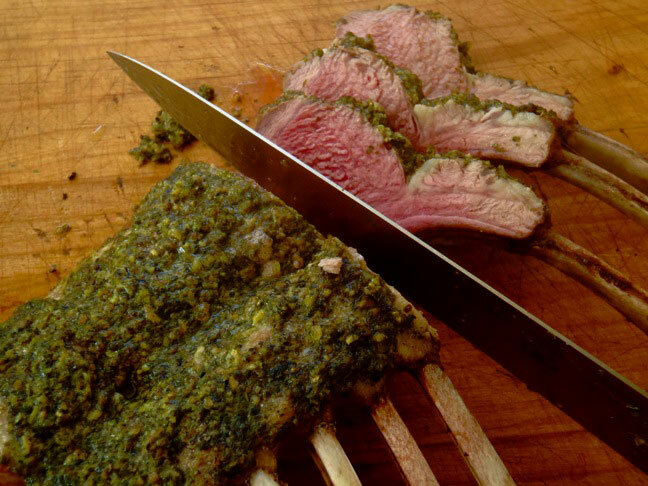 Divide the pesto into four parts and — using a small off-set spatula — spread an even, thin layer over the top of each rack of lamb. In a roasting pan large enough to comfortably hold the racks, roast them until rare to medium rare. 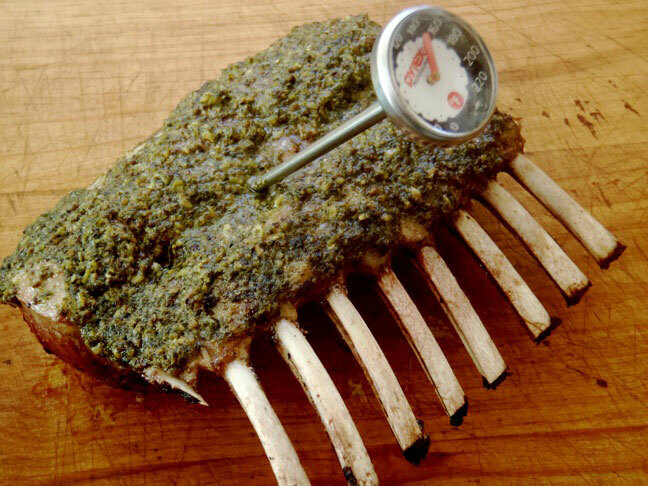 Use a meat thermometer to check them; the internal temperature should be 60 – 65ºC.. This should take about 25 minutes. 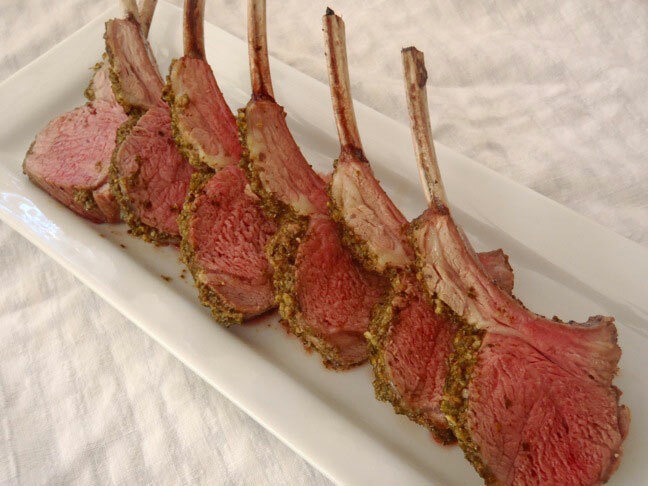 Allow the racks to rest for at least 10 minutes and then cut into chops. 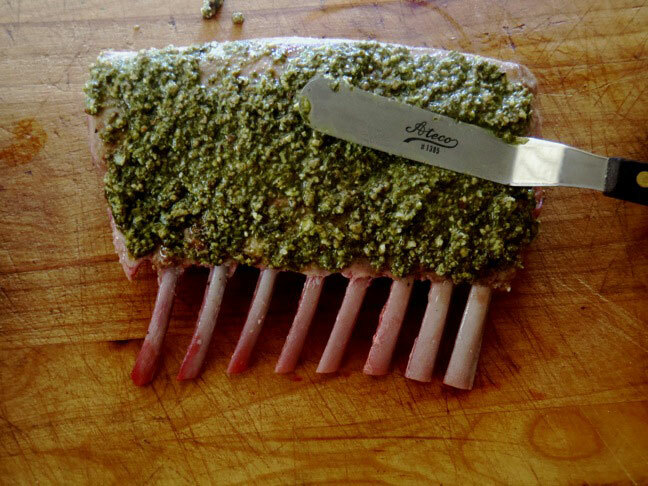 A frenched rack of lamb is one that has had meat and fat removed from each individual rib bone. This gives the rack a clean look for an elegant presentation. To save time, you can use a pre-made pesto. And to switch it up, this would also be great with Kale Pesto!